Davie property overflows with the scenic touch of Mother Nature. The Flamingo Gardens provide a place for locals and visitors to South Florida to experience the vitality of the landscape. Well over 50 acres boast both an impressive botanical garden, museum and wildlife sanctuary. The roots here are deep with the venue first created in 1929. Inside the botanical garden guests find an array of smaller, themed areas. Inspiration is often gathered in the hummingbird and butterfly gardens. Here residents learn how to recreate similar plots in the backyards of Davie homes. Both the Croton and Bromeliad gardens are also favorite spots to linger. The pride of the Flamingo Gardens is an extraordinary canopy of live oaks hundreds of years old. Intermixed among the trees are colorful orchids and epiphytes. Wanderers often wonder at the sites and sounds that have moved amongst these plants throughout the decades. Families spend much of their visit in the Children’s Garden. Youngsters can dig in and get hands on in this interactive space. Those wanting to really explore the grounds partake of a narrated tram tour. Folks travel into the depths of the Davie property through jungle growth, rainforest and wetlands. Riders wanting to stretch their legs can leave the tram, stroll about the Pioneer Walkway, and hop back on at a later time. Flamingo Gardens is home to a variety of South Florida wildlife. Many of the animals finding sanctuary here cannot survive on their own. Almost 100 species flourish under expert care. South Florida bird watchers are in absolute heaven when observing in the Free-flight Aviary. Hundreds of wading birds fluff their feathers and call out a hello. Nearby sits the Bird of Prey Center which has been declared as “the largest raptor collection in the United States.” Other magnificent animals in the wildlife sanctuary include otters, alligators, bobcats and panthers. Wildlife shows engage audiences teaching them all about these amazing animals and the importance to protect their habitats. Get to know the South Florida landscape. 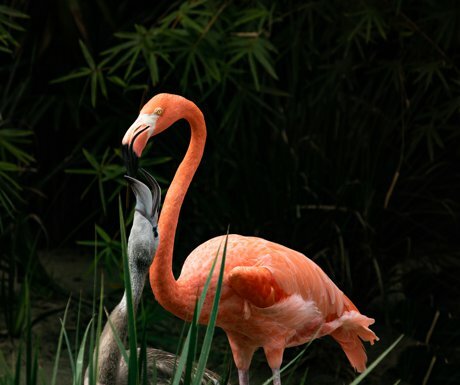 Plan a visit to the Flamingo Gardens today. It will truly take your breath away.